Keeping track of content. Recycling and reusing for results. 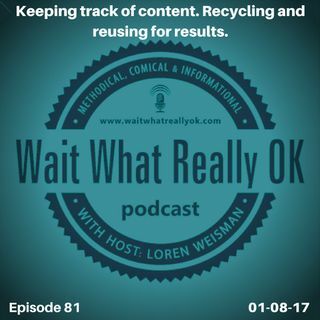 Wait What Really OK Podcast Episode 81 hosted by Branding Strategist and Keynote Speaker Loren Weisman discusses the concepts of tracing and indexing your content for the present and the future. Creating and posting content to align with your brand as it compounds your message is great, but when you are tracking and indexing your content, you can stay on top of the trends and hot spots to be able to repurpose, recycle and reuse ... Más informaciones content easily and more efficiently. Do you remember what you posted six months ago for your blog? By keeping an organized list of titles, links and graphics readily available for review, hot topics that you might have covered when they were not so hot can easily be found, accessed and reused again. This week, the podcast video supplement digs in further by answering the question, why do I need graphic covers for my videos. Episode 81 Keeping track of content. Recycling and reusing for results of the Brand Management and Marketing Podcast Wait What Really OK is available on iHeartRadio. Podcast Blog Supplement for Episode 81 of the Wait What Really OK Podcast with Loren Weisman. Podcast Link Supplement for Episode 81 of the Wait What Really OK Podcast with Loren Weisman. Why do I need graphic covers for my videos? Besides looking nice. Podcast Video Supplement for Episode 81 of the Wait What Really OK Podcast with Loren Weisman. Podcast Photo Supplement for Episode 81of the Wait What Really OK Podcast with Loren Weisman.